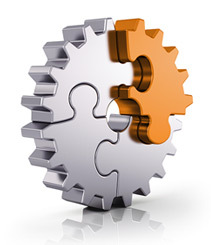 Our unique mix of resources, industry experiences and channels of influence enable GlobalFluency to deliver superior insights, highly differentiated programs and exceptional results for clients worldwide. We’ve done a lot and worked with some of the world's biggest brands. But for us, it all comes back to our core practice areas, led by teams with specialized knowledge in how to craft, create and execute like nobody else in the business. Marketers increasingly recognize that they must become thought leaders, knowledge brokers and insightful publishers to build rapport with target audiences and create strategic conversations with decision makers and influencers. At the core of this requirement is the need for a solid, validated, unique authority leadership platform on which a brand can stand and differentiate itself above the messaging din that is being increasingly ignored by our most sought after prospects. Customer-centric content and authority leadership are critical to building brand trust, accelerating lead acquisition and shortening selling cycles. Yet all too often, we witness random acts of content development. Brands have to pay more attention to content marketing performance, impact and return on investment, particularly as it relates to lead acquisition, customer predisposition, trust building and shortening of selling cycles. Global B2B companies need to engage with executives, professionals and market influencers around the world in order to understand changing needs and requirements,shape market perceptions, build brand relevance, and fill new business pipelines.Finding the right partners with ready access to these audiences and the ability to harvest and influence their thinking is paramount to getting the job done right. 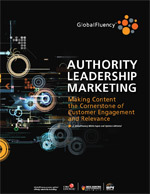 GlobalFluency has pioneered the developing of authority leadership marketing, having developed numerous affinity networks to help substantiate and validate key platforms and critical conversations for clients. Customer-centric content and authority leadership are critical to building brand trust, accelerating lead acquisition and shortening selling cycles. Yet all too often, we witness random acts of content development. Brands have to pay more attention to content marketing performance, impact and return on investment, particularly as it relates to lead acquisition, customer predisposition, trust building, and shortening of selling cycles. GlobalFluency looks at these “digital content factories” and looks to bring more rigor, creativity and strategic thinking to content specification, origination and packaging. Keeping a Closer Eye on Content ROI Donovan Neale-May delivered a presentation outlining the new content marketing imperatives facing brands, including a checklist of credible content attributes. 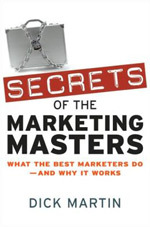 Secrets of the Marketing Masters: What the Best Marketers Do and Why It Works Donovan Neale-May outlines the Intelligent Market Engagement model and how influencing brand perception is vastly different than just publishing a white paper.